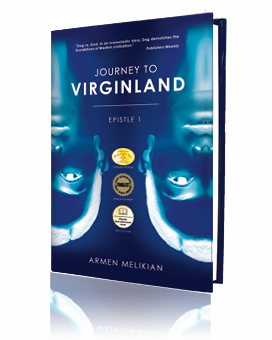 In his novel Journey to Virginland, Armen Melikian presents a spectacularly vibrant critique of Armenian history, treating it as an evolving human drama of universal resonance. Armenian history has often been portrayed in historic novels, with most works of the genre affirming a traditionally held, decidedly orthodox, view of the subject. A precious few works have cast a genuinely critical eye on the history of Armenia, but have done so in relation to only a specific period or event. The distinguishing merit of this novel lies not only in its relentlessly thought-provoking critique of Armenian history, but its thematic and speculative sweep. As a thinker and novelist, Melikian is both an insider and outsider: as he has spent much of his career studying Armenian history as well as myths, legends, and epic poetry, he is a highly respected scholar of these topics; and as someone who has gone against the grain to expose the many contradictions of Armenian history – especially with regard to the ruling elites and the belief systems they enforce – and propose an alternate vision of human development, he has been viewed by some as an outcast and even a traitor. This novel reflects both aspects of Melikian: the passionate historian dedicated to the ideal of a dynamic, creative Armenia contributing to human advancement; and an uncompromising critic of certain patterns which continue to hamper the flowering of Armenian history. Looking for a quality book on Armenian history? Get your copy of Journey to Virginland today!